Are you looking for Custom Name Necklaces for you or a loved one? Relax! You have reached your final destination. Valeria Fine Jewelry is your custom name pendant HQ. We can create a wide variety of Custom Name Necklaces not found in the chain stores and even some that most custom jewelers might not know how to make! This custom name pendant was a customer’s nickname. They couldn’t find a font they liked, so we created one. We then cast it in gold and set with diamonds. Put a stunning pendant around the neck of that someone special or yourself. It’s simple! We can easily create Custom Name Necklaces at prices that will surprise you. Design your own pendant with a skilled artists to show your unique style or tell a personal story. Whether you know exactly what you’re looking for or just have an idea for a beautiful piece of jewelry, we’ll design and create Custom Name Necklaces that will be the envy of all your friends. No matter what your style is, we have the font or design that will fit your personality. This diamond TRX pendant was created for a British hip hop group of the same name. They wanted wanted an iced out way to wear their name around their necks. So..we went to work and came up with this blingin’ piece that had 140 stones. We have access to thousands of fonts that we can use or we are also able to download ones that we don’t have. If you want something with a little bit of color, gemstones and enamel can be added. If you don’t want color in your Custom Name Necklaces, we can use one or a combination of many hand finishes to further make the piece yours. This Shorty Smooth Pendant was made for a guy who called himself that. He wanted a “smooth” pendant. We weren’t really sure what that meant, but we found a cool font and he loved it. Custom Name Necklaces are something that we specialize in and love making as there is so much leeway due to the size of these pieces. With unique and top level jewelry designers our manufacturing capabilities are only limited by the human imagination and physical casting properties. Our jewelry standards soar far above similar jewelry manufacturers in the industry, which is evident in our finished pieces. If Valeria Custom Jewelry creates any Custom Name Necklaces for you, you will soon grasp that you are wearing something that is an expertly crafted work of art in a sea of generic custom pendants. Please view our library of custom pendants and see for yourself. This custom pendant is one of our Monogram Name Necklaces that we created with a customer’s initials. He didn’t want a traditional monogram look, so we took those 3 letters and arranged them in a more unique way. We can create these pendants in whatever fonts that you like and will arrange the letters in a far cooler way than the standard monogram. Even if you can find something similar to what you want online or at the mall, it will be mass produced in Asian sweatshops. It will also be of far lower quality that you would receive from us. But the majority of Custom Name Necklaces people are looking for will have to be made in the US. They will probably cost more than one from us as well because our prices are very hard to beat. Do you have a nickname or catch phrase you want to wear around your neck? Do you want it noticed from across the room? We can create iced out necklaces to your specs for less than most because of our procurement process. Custom Jewelry is often passed down due the emotional significance of such pieces. Since designing and developing Custom Name Necklaces is a specialty of ours, we help you get custom pendants within your budget. The Custom Name Necklaces that we create are the perfect jewelry options for pieces otherwise unavailable at a retail store. Whether your budget is $300 or $5000, we will surpass your expectations in both quality and service. We want every one of our clients to feel special. Consequently, we will do whatever it takes to make sure that happens. Our goal is that your experience is one that causes you to tell all of your friends, family and anyone else about us. We are trying to cultivate lifetime relationships, not single purchase customers. Do you want to commemorate your family name in a piece of custom jewelry you pass down to the next generation? We can create all kinds of nameplate pendants that you wold be proud to wear. We get ALL kinds of requests for Custom Name Necklaces. Even if it profane or dirty, we don’t care; yo can’t offend us! We will make custom name necklaces with anything as long as it will cast and be durable. My name is Lucas Horton and I own and run Valeria Fine Jewelry in Dallas, Texas. Our aim is to take your idea or work with you to come up with an idea that will end up as a stunning piece of custom jewelry. If you give Valeria Fine Jewelry a chance to show you what we can do for you. We are confident that our design skill, value, quality, and knowledge will be evident from the start. It will also be evident that we are the best choice to turn your vision and dreams into reality. Nobody creates Custom Name Necklaces better than Valeria Fine Jewelry! 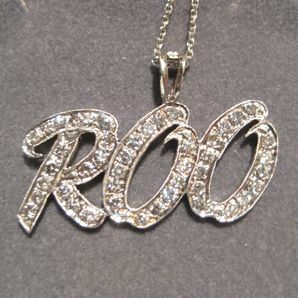 Click HERE to see more of our Custom Name Necklaces or to contact us with your idea for a quote. Or, click HERE to learn more about custom jewelry in general or to view our portfolio. Our mantra is…If you can dream it, we can create it!